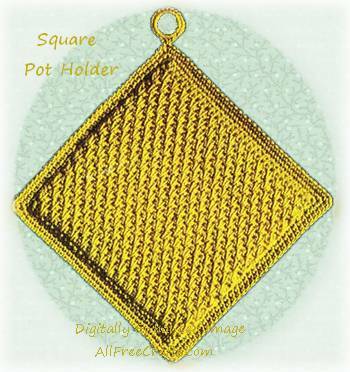 The classic square pot holder is well represented here, in this free pattern from Coats and Clark’s New Quick Tricks to Crochet and Knit, published in 1953.
in a color of your choosing. » COATS & CLARK’s O.N.T. “SPEED-CRO-SHEEN” MERCERIZED COTTON, Art. C. 44: 2 balls of No. 10-A Canary Yellow. » Milwards Steel Crochet Hook: No. 2/0 (double zero). Editor’s Note: In metric terms, this is equivalent to a 3.5mm hook. Starting at bottom, make a chain 7 inches long. 1st row: Sc in 2nd ch from hook, sc in each ch across until row measures 6 inches, having an uneven number of sc. Cut off remaining chain. Ch. 1, turn. 2nd and 3rd rows: Sc in each sc across. 4th row: Sc in first sc, * insert hook in base of next sc 2 rows below and draw loop through to height of row in work, thread over and draw through both loops on hook (long sc made), sc in next sc. Repeat from * across. Ch 1, turn. 5th row: Sc in each st across. Ch 1, turn. 6th row: Make a long sc in first sc 2 rows below. * sc in next sc, make a long sc in next sc. Repeat from * across. Ch 1, turn. 7th row: Repeat 5th row. Repeat 4th to 7th rows incl until piece is square, ending with 4th row. Break off. Make another piece the same way. BORDER…1st rnd: With wrong sides facing and working through both thicknesses, attach thread to any corner, 3 sc in same place, sc closely around, making 3 sc in each corner. Join. 2nd and 3 rnds: Sc in each sc around, making 3 sc in center sc of each corner. Join. Break off at end of 3rd rnd. Sc closely around bone ring. Sew in place.